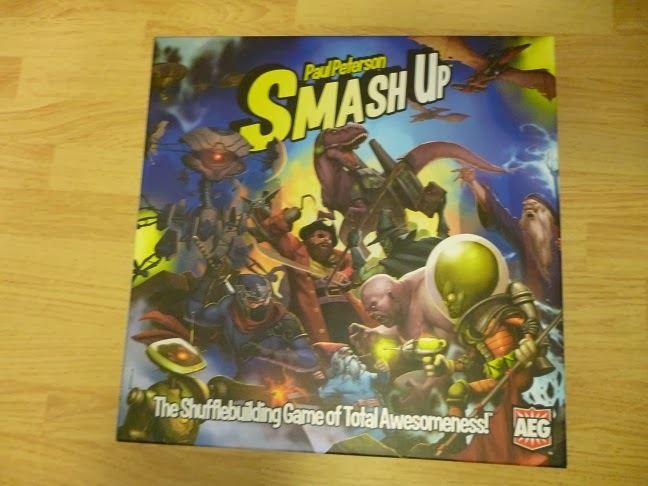 Smash-Up is a unique game released in 2012 by AEG games. It's a card game that represents several factions fighting over control points in the game, with the eventual winner being the player to reach 15 points. Of course, the real goal of the game is to see the different factions fight with each other. Because those factions represent a dizzyingly wide array of genres from all over the cultural landscape--we're talking Robots and Ninjas and Dinosaurs plowing up against each other over pirate ships and zombie graveyards. This awkward yet awesome mixing of different genres catapults this game into chaotic, if nonsensical, fun. The actual base rules of the game are alarmingly simple. Each player is randomly assigned two factions. So in one game you might be the Robot Wizards while in another game you might be the Pirate Aliens. Each faction (there are eight in the base game) has their own strengths and weaknesses; combining two of them generally makes the game balance itself (although with some exceptions; see below). 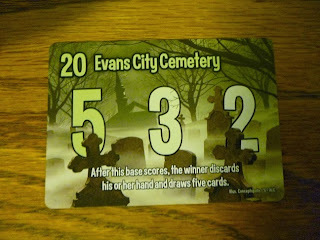 For example, the Zombies are good at recovering cards from the discard deck (get it?) while Pirates are good at moving from place to place. 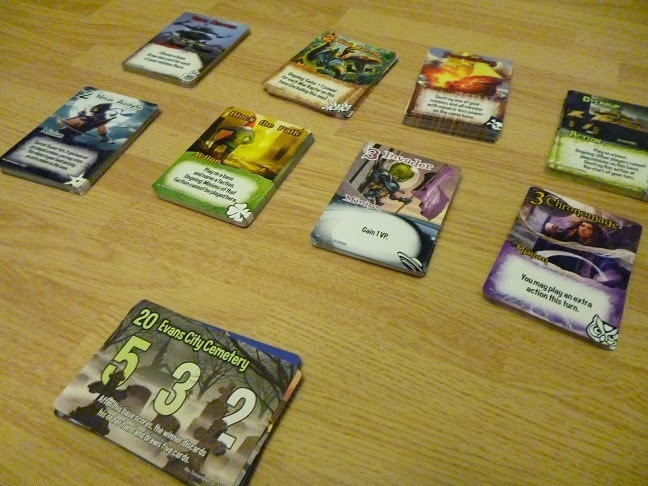 There are twenty cards in each faction, so each player starts the game with forty cards. 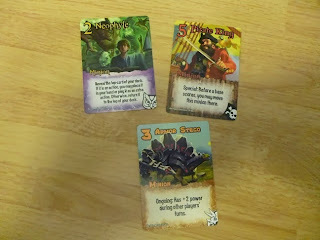 All of the faction decks: Robots, Dinosaurs, Pirates, Zombies, Ninjas, Tricksters, Aliens, and Wizards. The base deck is at the bottom. There are two types of cards; Minions and Actions. Minions represent actual entities--the robots, aliens, zombies, etc. Actions are one-off opportunities that are generally discarded upon use. All Minions and all Actions have some sort of special ability. Examples of Minions. Clockwise from the top left: Wizards, Pirates, and Dinosaurs. Note the Strength number at the top left, the special ability at the bottom, and the faction icon on the bottom right. Each turn, a player may take two actions; they may play one Minion from their hand and play one Action from their hand. They can't play two Minions or two actions, although they can choose to only take one action. They then draw two cards and add it to their hand; your hand maximum is ten, so you have to discard down if you go over. At the beginning of the game, three "bases" are placed on the board. Bases represent places where your minions are fighting. Each base has a special ability and three point values; it also has a "Breaking Point" that determines when it is won. Example of a base. The number in the top left is the Breaking Point; the score values are first through third place, from left to right. The Special Ability is at the bottom. When a player plays a Minion, they simply place the Minion on any base they wish. Each Minion has a Strength. Once the Strength of all Minions of all players meets or exceeds that base's Breaking Point, the base is scored. The player who has the most points wins the leftmost score; the runner up, the next number, and the third the rightmost score. Anyone else does not score. That's it; the first player to 15 wins. Of course, the game is much more than simply placing Minions on bases until someone wins. If you hadn't noticed, each card in the game has some sort of special ability. These abilities affect other cards, cancel other cards, destroy other cards, increase and decrease strength--pretty much anything and everything. Plus, a lot of cards allow you to do a lot more than just play one Action and one Minion. The result is a game full of awesome chaos. While you can certainly plan--the cards don't veer that far off of the base rules--your best laid plans are bound to be disrupted in one way or another. Of course, knowing roughly the sort of powers each faction has players can defend against it, but, still, it's a fantastic setup that plays quick enough that you won't find things slogging down too much. The Theme. There's something particularly fascinating about just jamming all of these genres into a game, and making it work pretty well. Sure, it's kinda stupid to have leprechauns riding dinosaurs with lasers, but that's kind of the whole point, isn't it? Play Time: With a victory point level of 15, the game plays pretty quick, especially when you keep it at 4 players or less. (With only eight factions, in the base game you can have a max of four players. If you get any expansions or buy another set, you can expand this to more players, but I've never tried that.) With a game with this amount of chaos, you don't want a long, drawn-out game. The games I have played have ended in 30-45 minutes, and that sounds about right. The Price Point: You may get a bit of a shock when you buy the game--it's a card game, and you'll pay thirty bucks for a stack of cards and an insert. At first glance this might seem like a ripoff, but once you realize how the game operates, how quickly it plays, and how many plays you'll get out of it, you'll find that the price is just about right. Art and Graphic Design: Done very, very well. The Chaotic Combinations: Smash-Up's greatest asset can also be its greatest drawback. The odd and strange combinations that make this game so fun can also cause a lot of headaches. For games like this, where there are simple rules but complicated cards, the designers need to be very careful as to how they define terms. For example, they use "killed" and "discarded" interchangeably, but also define them to be different terms meaning exact same thing. Then why not just use one term? There's also some wonky logical wording that requires some off-the-cuff judgement to use. Components: A lot of people have complained that it cheaps out on components; since the game is already just cards, but in reality you need some way to keep score (and keep track of the total strength of minions on a base) they should have included some sort of tokens and/or markers. This doesn't bother me as much as it bothers some, but I suppose it's worth pointing out. The Verdict: This is a pretty good game. Yeah, there's a lot of randomness and chaos, but it's not that bad. Add to that a pretty quick playing time, easy setup, and simple rules to teach, and it's a decent game to get your money's worth pretty quickly.